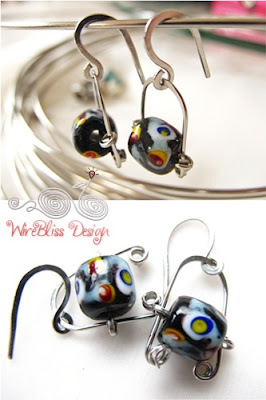 These are very special one of a kind beads due to its colorful combination. The handmade nature of the process and the natural individuality of the clay and colors result in variations from bead to bead, expressed in differences of shape, sizes, texture and color. This pair of earrings is experimental. All components are handmade with lots of hammering on the 19g stainless steel wire. The ear hook was OK as I hammered after shaping them. The toughest part was twisting the wires that hold the beads. I can only twist them after hammering the wire ends flat so it was really really tough and hard work. Almost gave up on that. Glad I didn't break my pliers. Before signing off, don't forget to check out my Tutorial Giveaway at Magpie Gemstones. If you you click on this link - http://www.magpiegemstones.com/news.html and sign up for the newsletter, you'll get the chance to win. Great earrings Mei...I particularly like the beads they are great!!! I've never used stainless steel wire, sounds rather difficult to use. If you work with stainless steel wire (soft one of course) all the time, you'll get use to it. It is slightly harder than other wires but they are great as you can see in all the jewelry I created here. One day maybe you can give it a try and let me know what you think.